The current decade has been a very good one for Irish horror. While they haven't quite reached the same kind of transgressive peak that extreme French horror did in the last decade with Frontiere(s), Inside, and Martyrs, Ireland's current horror boom is putting the Island nation back on the genre film map in a very noticeable way. Dennis Bartok's Nails takes this trend, and many of its recurring themes and builds on it with a solid addition to the canon of modern Irish horror. 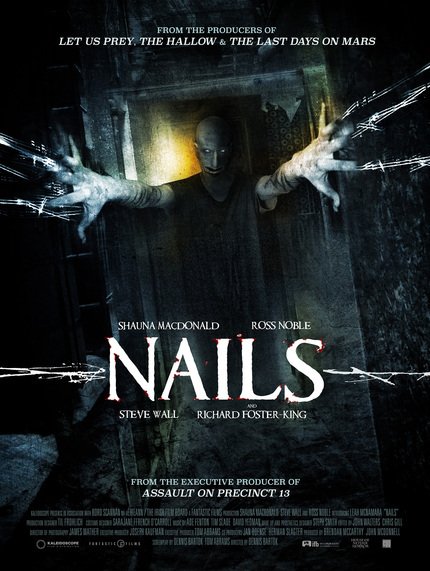 Nails is the story of health-nut, wife, and mother, Dana (The Descent's Shauna MacDonald), who is horribly injured after being hit by a car and ends up in long term care in the hospital. Completely bed-ridden while attempting to heal, Dana starts to see visions of a terrifying specter who threatens her the second she is left alone. When she tries to tell her caretakers about her visions, she is dismissed outright by all by her orderly, Trevor (comedian Ross Noble). The visions become more and more violent until the spirit, Nails, finally attacks her, leaving her skin shredded and her husband and caretakers at a loss to explain what they thought was creeping cabin fever. Her frequent solitude combined with the fact that no one believes her leaves Dana alone to face her literal demon. This will not end well. Unlike previous entries in recent Irish horror history, Nails doesn't rely on local folk tales (The Hallow) or Catholic guilt (Let Us Prey), the story is far more universal. However, that doesn't mean that is doesn't take what is effective about those films and put it into play in a new way. Like both of those film, the central conflicts in Nails are based around the protagonist's isolation. Dana is a wife and mother who is stripped of almost all forms of her identity by her hospitalization. She cannot effectively mother her child, nor be a caring wife to her husband. She is left alone with not only her struggle to recuperate, but also the personal guilt that comes with the feeling that she has abandoned her family. On top of that personal guilt and loss of self, she faces another major blow to her identity by being confined to her hospital bed. Nails begins with an extended sequence of Dana's daily routine. She's a fitness fanatic, we see her getting up early, doing yoga, and jogging for miles before beginning her day. This focus on having a healthy body is a big part of her personality that she also cannot maintain because of her injuries. The contradiction between her inner desire to be healthy and the senseless loss of her physical faculties tears at her throughout the film. Dana is a physically strong woman, but she is tested day in and day out by her inability to display that strength even in the most minute of ways while confined her to hospital bed. MacDonald's performance in the film is far and away the most appealing. She's forced to do a lot with not much in terms of interaction, the majority of the film is her either alone or with Trevor, discussing her fears all the while sounding like a crazy person. Her mental deterioration is very evident through the film, and MacDonald does a solid job of portraying this woman who feels abandoned by her family and her body. That's not to say that Nails is a strictly psychological horror film, in fact, that's probably the furthest thing from the truth. At its core, Nails wants to scare, and it does a very good job of delivering on that front. The Nails character is an imposing figure, all arms and legs and horrifyingly long fingernails that will make the OCD crowd shiver in terror. The realization of Nails on screen is a bit muddled from time to time, but fans of Japanese horrors like The Grudge and Ringu will certainly recognize some influence there. Where the film suffers is bridging the gap between the best horror films of its ilk and the crowd-pleaser it ultimately wants to be. Films like Jennifer Kent's The Babadook do a better job of marrying the psychological horror and visceral terror of the unseen stalker. Dana's isolation in the hospital makes it a bit tougher to build the kind of bond that makes The Babadook one of the best horror films of the decade. There is a lack of some connective tissue that would bring Nails to the next level. Character motivations, both good and bad, are a bit unclear and there are times when it seems like greater attention to pathos would've helped the audience connect on a more emotional level. While not exactly minor quibbles, my problems with Nails are largely academic. This is a film for horror fans, and I think horror fans will be pleased. The story is engaging, the characters are mostly sympathetic, and the scares are fun. Your mileage may vary as far as what you expect from modern horror, those for whom arthouse horror is the only way forward may not be as enamored of the film as I am. However, if you're looking for some honest to goodness scares, Nails is the ticket.